Spike Out Sepsis raised over $22,000 while observing 10 years of raising sepsis awareness in the Columbus, Ohio area. 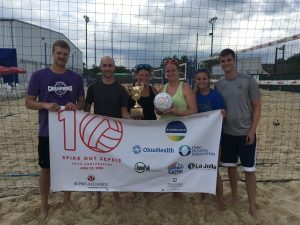 Columbus, OH – On June 23, twenty volleyball teams took the court at Flannagan’s Dublin in Columbus, Ohio for Spike Out Sepsis, to raise awareness of sepsis as a medical emergency and raise valuable funds for sepsis awareness programs. Bump Set Mouth to Mouth won the tournament, taking home a customized “SOS 10th Anniversary” volleyball, while The Donation Dominators won the fundraising contest, bringing in over $900 as a team. Sepsis is the body’s overwhelming and life-threatening response to an infection, which can lead to tissue damage, organ failure, and even death. Though sepsis is the leading cause of death in hospitals, only 58% of American adults even recognize the word sepsis, and fewer can identify the signs and symptoms that would alert them to go to the hospital immediately and seek care. Spike Out Sepsis, a unique 6-on-6 sand volleyball tournament, was started by Sepsis Alliance Board Member Dr. Jim O’Brien, along with a team of dedicated nurses in 2008 to raise awareness of sepsis as a medical emergency in the state of Ohio. Since inception, the Spike Out Sepsis model has spread to other states, such as Georgia and California, and has become a part of the Sepsis Challenge™ event series. In total, Spike Out Sepsis events have raised well over $150,000 for sepsis awareness programs all over the country. Sepsis Alliance would like to thank bioMérieux, Inc. (National Presenting Sponsor), OhioHealth and Ohio Hospital Association (Court Sponsors), Inno-Pak, White Castle, and La Jolla Pharmaceutical (Platinum Sponsors), and Remington-Davis (Gold Sponsor). In addition, Sepsis Alliance would like to thank Kendall Erikson for designing the limited edition 10th Anniversary logo for Spike Out Sepsis. Sepsis Alliance is North America’s leading sepsis patient advocacy non-profit. Sepsis Alliance’s mission is to save lives and reduce suffering by raising awareness of sepsis as a medical emergency. The sepsis.org website receives more than 2.5 million visits each year. Sepsis Alliance is a 501(c)(3) charitable organization and a GuideStar Gold Rate Charity. For more information, please visit www.sepsis.org. Connect with us on Facebook and Twitter at @SepsisAlliance.